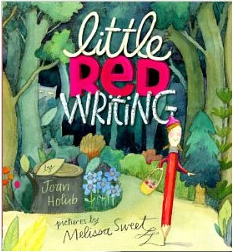 AAUW of North Carolina is pleased to announce the winner of the 2014 Juvenile Literature Award: Joan Holub for Little Red Writing. For more than 60 years, the North Carolina Literary and Historical Association has administered this award to a North Carolinian for the best example of juvenile literature published in the previous year. AAUW NC President Mary Peterson presented the award to Ms. Holub in November. Lillian Van Order of the Wilmington branch assisted in the presentation and coordination with the Literary and Historical Association. Ms. Holub will join us for part of the meeting and will be available to sign books.